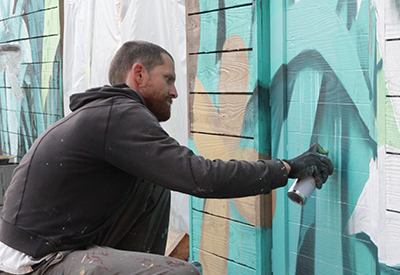 To get streetart off the street and to bring it in the company is a project born in 2017. 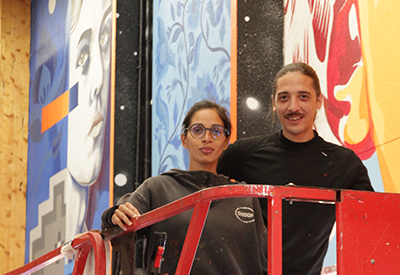 After meeting the association L’art prend la rue (http://www.street-art-avenue.com), Ecodis has decided to get artists to move into the heart of the company. Two major walls are chosen: the exterior one, turned towards the visitors and the biggest interior wall of the warehouse, right side order pickers. Dourone has realized the interior wall and Mika the outside. Artists have painted the two walls within a month of each other. Numerous contacts with employees happened during the creations. Arts are beautiful, turned towards a better world, fairer and more balanced, that is the utopia of the company. This project will undoubtedly be the first of a long series!